Colombo,Sri Lanka’s former president Chandrika Kumaratunga Tuesday blamed President Maithripala Sirisena for the 51-day power tussle in the island nation, saying the SLFP party would not approve his plans to have an alliance with former strongman Mahinda Rajapaksa. In a strongly-worded letter to the President, Kumaratunga called for an urgent meeting with him to discuss the future of the Sri Lanka Freedom Party (SLFP). The island nation witnessed a 51-day political crisis after Sirisena controversially sacked Prime Minister Ranil Wickeremesinghe and installed Rajapaksa in his place on October 26. Sirisena later dissolved Parliament, almost 20 months before its term was to end, and ordered snap polls. The Supreme Court, however, overturned his decisions. Wickremesinghe was last month administered the oath of office after Rajapaksa resigned. Sirisena’s alliance with Rajapaksa, who in November ended his five-decade-long association with the SLFP and joined the newly-formed Sri Lanka People’s Party (SLPP), has not gone down well with his party leaders. A section of the SLFP, led by Kumaratunga who remains an SLFP loyalist even 14 years after handing over the leadership to Rajapaksa in 2005, has criticised Sirisena. Kumaratunga, who was Sri Lanka’s fifth President from 1994 to 2005, said the party would not approve his new alliance with Rajapaksa. Sirisena, meanwhile, departed for a four-day official visit to the Philippines, his office said, amid mounting pressure on him after his failed attempt to install Rajapaksa as the prime minister. Sirisena succeeded Rajapaksa as the SLFP leader in January, 2015 when he defeated the former strongman with electoral support coming from SLFP’s arch-rival, the United National Party (UNP) of prime minister Wickremesinghe. Rajapaksa’s SLPP defeated both the SLFP and the UNP in the local-level elections held in February last year. A wider section of the SLPP remains opposed to Sirisena’s leadership and said it would not endorse him in the event of a snap presidential election which must be held before January 2020. 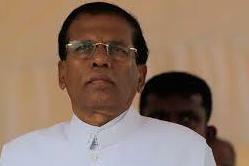 The SLPP’s local councilors have said they would not back Sirisena’s nomination for the next presidential election. They want a member of the Rajapaksa family to become the main candidate to fight a UNP challenger. Rajapaksa, who has been Sri Lanka’s President twice, cannot run for the third term.